In Carolyn's last blog we met Ibrahim, a man living in Dadaab refugee camp in Kenya. Ibrahim and his wife help care for many of the children in the camp, including six of their own. Ibrahim leads us into a tiny mud and stick room, swept clean and bare. On a thin mattress covered with a simple cloth sits a small teenager holding a beautiful baby. Her name is Isnino and she is 16. Her baby Habibo is small but alert and looks healthy. Carolyn sits with Isnino Adan and her two-month old baby girl, Habibo. I sit on a stool with our one of our staff to interpret and ask her how she came to be here in Ibrahim's house. At first, she looks away shyly as she tells me about how her family in Somalia was split apart, how she was married off by her father when she was 12 and how she left to look for her mother when the hunger became too bad. As she tells me the next part of her story, she finally looks at me and you can see the sadness in her eyes. "I lived in the bush for several weeks with nothing but this cloth to cover me," she says as she points to the cloth now covering her bed. "I knew I had to get somewhere where there was food but did not know how to get there. I knew my unborn baby also needed me to eat". She describes how she then managed to find a truck going to Kenya and how she used her last bit of money to pay for a ride. The truck was packed full of people and Isnino was wedged under many others for the two day journey. On the second day of the journey, Isnino gave birth to her daughter inside the truck, surrounded by other refugees. She was too exhausted and scared to feel much happiness but hoped where she was going would be a better place for her daughter. When she arrived at the reception center, Isnino and her newborn baby were lucky to be moved quickly through the long line where thousands of refugees were waiting to be registered. Because she had just given birth, she was taken quickly to the hospital and Save the Children, the agency in charge of child protection, was contacted. Save the Children staff knew Ibrahim was willing to take in more children as a foster parent but would he and his wife accept this young girl and her fragile, newborn baby? Miraculously, he immediately agreed and Isnino and Habibo came to stay in the small mud room where I find her now, a few months after her horrible journey. After telling me her courageous story, I ask Isnino if she thinks she may be able to find any of her family here. She tells me she doesn't know where her mother might be but her father has been in contact. "I hope he can come to visit me so I can find out how my brothers and sisters are doing. I am worried for them because there was no food when I left. I am safe here and my baby and I have what I need but they had nothing". Carolyn stands with Ibrahim Adan, 48, (holding child) and his wife, Aisha (center), who have been foster parents in the Dadaab refugee camp in Kenya for Save the Children since 2007. As I meet with children and families here in the sprawling refugee camps of northeastern Kenya, I hear amazing and harrowing stories. Yesterday we visited the original refugee camp called IFO - a part of the camps that has been here since 1992. We drove up a dusty red sandy road to a thick fence made from gnarled tree branches. Inside the fence was a family of 10, living simply in two tiny mud and stick structures with few possessions. But this was no ordinary family. It was led by Ibrahim, a thoroughly generous and engaging man with much hardship in his life. He came from Somalia in 1991 during horrible fighting in his country. He settled in the original camp with his wife and young son after a tough journey of hundreds of miles. Ibrahim later lost his wife and four of his children to disease. He remarried though and had 6 more children. He and his wife also care for many more children in his area of the camp. As we talk, his children come to sit on his lap, next to him on an old can or peek out from behind his back. You can tell how much they love him. He tells me, "God gives back to those who do something for others, especially children." But what makes Ibrahim such a special man is that he and his wife, despite being very poor, have taken in yet another two children. A 13-year-old mother and her newborn baby girl who arrived two months ago from Somalia after their own grueling journey. Ibrahim and his wife agreed to be a foster family for the teen mom and baby as part of Save the Children's child protection program. Despite having so little, they share what they do have with others. As I left Haiti today to travel on to India, my last remembrance was of a beautiful little girl named Beatrice (pictured below) who sang a little song in Creole for us inside her tented classroom. I thought of how because of a few hours time she was there today. We visited her school in Carrefour that is supported by Save the Children donors and heard from the headmaster how the three story school where Beatrice had studied until the quake had totally collapsed in January 2010, pancaking one floor on top of the other into a heap. Thankfully the children had already left by the late afternoon, otherwise, he said that literally hundreds of his students, including maybe the lovely little girl I met today would have been crushed. Tragically, the school did lose 4 of its students and many families lost loved ones. But by April, Beatrice and her classmates were back in school - in tents versus a cement building but starting back to learning all the same. Getting kids back to school quickly after an emergency is one of the most effective ways to help kids deal with the trauma of a disaster. The three large tents now each hold three classes, separated by a fabric barrier and filled with small wooden benches and desks. They are noisy and get hot in the spring and summer and until reinforced with more tarps recently, they leaked in the heavy rains. But no one we talked to - not the headmaster, not the teachers, not the parents, and certainly not Beatrice were unhappy with their tented classes. They were just happy to be back together as a school and learning. While the headmaster waits for access to land where he can rebuild, the tents will serve as classrooms for about 160 children. Many of the schools like this one are what are called "private" schools in Haiti. Because the school system can't provide enough classrooms and the demand for education is high enough, a private school industry has existed for many years in Haiti. Parents pay between $100 and $300 per year for school, not including books, uniforms, and supplies. This cost represents a very big sacrifice for many families. And the headmaster told us that this past year many of the parents could not pay school fees because they lost jobs and homes and spouses. He was hanging on, trying to keep his school running, paying rent and teacher salaries. The support from Save the Children in the form of tents, furniture, teacher training and supplies was a big part of what kept his students in school. 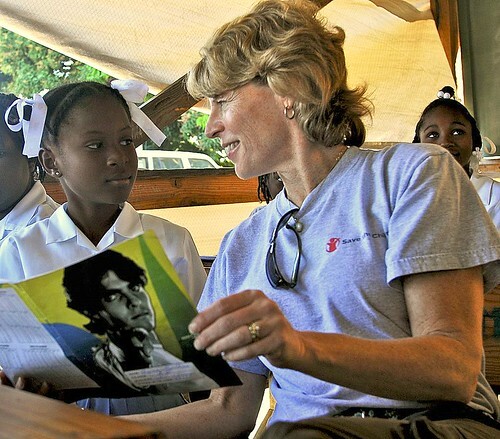 This school is one of 270 in Haiti that Save the Children has supported. 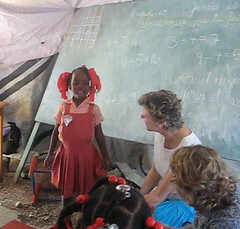 Education is a key program for the future of Haiti and we hope to invest more and raise more funds for education in 2011. It remains the most important thing we can focus on for Haiti's children and meeting Beatrice today just made me all the more convinced that school has to be a big part of what Save the Children does in Haiti this year. The water has receded in Swat but has left behind vast needs. Over 1,600 people died in the floods, many of them in this area when water from the mountains came rushing down into villages, bringing lots of large trees and debris, which tore away bridges, sheared off houses along the river and swept away whole villages. One of our staff at the local Save the Children office showed us pictures of that day - torrents of water running through what was the main street of his village. He told me stoically that the next day the main part of the village was gone. He lost several friends to the rushing water. It will take a long time to get things back to normal in an area that was considered to be one of the most beautiful in the country, with steep green mountains, lush orchards and farms, and many streams and rivers. It used to be a place Pakistanis and visitors came to get away from the heat and crowds of the city. That won't be true for a long time now. Swat is not unaccustomed to misery. This also is an area that was devastated by conflict the last year, with heavy shelling between the Taliban and army displacing tens of thousands. Families were just starting to return to their homes and beginning to recover when the heavy rains hit this July. Children are suffering from diarrhea and skin diseases caused by dirty water. They need to get back to normal routines and start school again. They were happy to see us today but several told us with sadness in their eyes about how the water rose so quickly, forcing some of them out their homes in the middle of the night. When they returned many of their homes were missing or damaged, their land eaten away by the surging river. The greatest needs right now are still for the basics — household supplies like buckets, jerry cans, soap and pots and pans as families lost everything. Food is also needed as fields were swept away along the banks of the river. I saw a distribution of household and hygiene kits, a tent distribution, a health clinic and hygiene training, and saw the first day of our food voucher program. With this program, funded by Food for Peace, we are able to give families vouchers that they can use in the local market to buy the foodstuffs they most need. Our staff who manage the program told us "This works so well because it isn’t a hand-out and it lets people buy what they want from the local shopkeepers". The vouchers will buy enough food for a month and support the local economy as well. I met a young girl of about 13 years old. Because of the fighting, she had been out of school for several years. She had recently returned home and thought this would be the year she could start school again. Sadly, the floods have damaged her school and now she must wait again to start back. Without help, she and others like her will miss out on all the opportunities that an education offers. Save the Children's work on distribution of non-food items, mobile medical clinics, food voucher distribution, and child-friendly spaces is helping tens of thousands of people in the Swat valley. It is just a part of the work we are doing in many areas along the main rivers where more than 17 million people have been affected by the floods. As our staff in Pakistan work hard to meet the needs of children here, they worry that they will not have enough resources and people will start to forget about the tremendous difficulties still to come. The international humanitarian community and people around the world need to continue to help Pakistan recover from this largest disaster they have ever experienced. For more information on Save the Children's response in Pakistan and for ways to help, please visit our Pakistan Flood Emergency page.